After many years of flailing away looking for the right strategy, we are seeing DtC sales homogenize around a common theme. Wineries build a tasting room with a design statement. That's 'the experience.' Customers come to the winery, pay a fee and receive a curated tasting of wine. At the end of the tasting, the customer is invited to join the wine club and somewhere around 7% accept. It's working, and if you believe the stats that came out yesterday, DtC sales in February 2017 were 37% higher than February 2016. 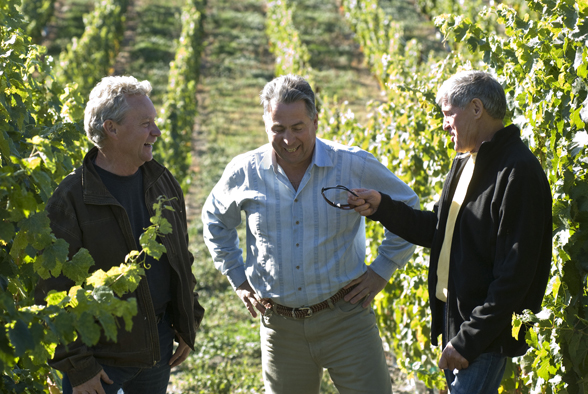 Owners today understand what the strategy should be for small family owned wineries. Totally absent 4 years ago, there is now a growing level of professional DtC Managers who are well paid and professionally running direct winery sales. Tasting rooms are improving in their sales training and compensation structures. Fully sixty percent of an average winery's sales now are made direct. That sounds pretty good, so what's there to worry about? Wineries have four basic ways to increase club revenue. They either sell members more wine, increase the price on the same number of bottles sold, keep the same member in their club longer, or they increase their membership numbers. While club tenure seems to be increasing slightly overall to 28 months on average now (headline slide), price increases are hard to come by, and selling more bottles will only shorten the club tenure in most cases. That leaves growing members as the main vehicle for revenue growth. If wineries insist that clubs can only be built from people visiting the tasting room, you are purposefully ignoring the other 99% of the population that wont ever visit your tasting room. Therein lies the future barrier we will have to cross. How are you going to sell to people who don't come through your tasting room door? With the experience narrowly defined within the tasting room today, how will you deliver an experience to people away from the tasting room? I've got some ideas that will be the source of future posts, but what do you think? Weigh in with Your Thoughts and Opinions!! Please join the site in the upper right hand of the page and offer your own thoughts for the benefit of the wine community. And if you think the discussion is worthwhile, please promote this on your favorite social media platform. This should open up minds of everyone working in the Direct to Consumer end of the wine industry. I've never seen a winery website which led with "here are our great events, join our club and come out and have fun." That could have the advantage of getting people to sign up for the club, but then don't attend the events. With attendance limited, picking up 200 club members, but only having 50 attend would be good. That would be 150 club members who never visited the winery. It would take some work to keep those "no-shows" in the club -- but that could be worthwhile. All the issues of "getting inside the heads" of the consumer still apply in this media overload world. Mike - thanks for offering your insight. There is some sense to creating event in other cities around the country - away from the winery and looking for club member at the event. That said, the work needed to pull off events elsewhere is a new challenge. Maybe we look more at cross promotion and start sponsoring small events - vintage races? etc - where there are likely fine wine consumers. I've worked for 15 years in the wine industry, and my first job was with Windsor Vineyards. They were/are the king of DTC wine sales. They ran a very nice business ($20 Million), and they DID NOT have a wine club. Don't get me wrong, wine clubs are a wonderful DTC sales & marketing strategy. But as you so nicely pointed out Rob, they have their limitations. It is essential that DTC strategies become more diversified. The conversation needs to shift to selling wines DTC without relying exclusively on tasting rooms & wine clubs. It can be done. We know fine wine has to include 'experience' in the value proposition. The problem is, the industry has too narrowly defined experience. The definition today means consumer have to come to the tasting room and winery. The next round of DtC has to move away from that notion. We have to find scalable, electronic, and otherwise different ways to sell wine. Clubs are fine. They have a place but to make this business work when the three tier has abandoned 80% of the wineries, we are going to have to radically evolve! ....... well .... at least my fingers to God's ears anyway. I know that God hears my prayers, but does he read my blog? I did a study last year with Dr. Howard Moskowitz- "Millennials, Mindsets, & Money ... and Selling Wine Online" - focused on the topic of wineries selling bottles of wine directly online. The findings and suggested strategies are available in a complimentary e-book. (email info@sdrconsultingllc.com for a copy). The idea was that for wineries to grow their sales, they should look into complementing club and tasting-room sales by developing their e-commerce channel. The study of over 900 people investigated the ideas that people have about buying wine online - which turn people on and which turn people off, their mindsets. The study quantifies the power of individual marketing messages to raise or lower interest in buying wine online, the 3 mindsets of online wine buyers, the emotional drivers of online wine sales, and concludes by offering three strategies for marketing wine online. Stephen - Ecommerce represents only about 1.5% of total small winery sales right now. It's dwarfed by e-commerce from other e-tailers as a channel. Is it an opportunity? Absolutely, but the challenges faced are also daunting from the producer side. Is there a tactical suggestion you can offer a winery here to help grow e-commerce sales? Rob – thank you for your comment and question. Yes, the report provides tactical suggestions that wineries can implement today. Before I explain that I’d like to stress that the report acknowledges that winery e-commerce is a long-game, but one worth playing for the reason you cited – it’s likely to develop over time. The report does not promote ecommerce as a magic bullet or replacement. Winery e-commerce complements the existing sales and distribution channels and relationships wineries have in place today. Winery e-commerce offers the potential advantage of strengthening a winery's financial position while improving its chances for longer-term survival or accomplishing a business goal, such as a gaining physical distribution, market expansion, or outright sale. Although base sales are small, if wineries can increase their ecommerce sales from 2% to 3%, that’s a gain of 50% revenue from the channel. Gross margins may be higher on those sales because wineries do not have to give up margin to third-parties. Tactically, the report offers three strategies, one for each of three segments the research identified. Each strategy includes a target market. For each target market we identify: a combination of specific messages that raise consumer interest in winery e-commerce; the emotions that motivate consumers to be interested in winery e-commerce; and a financial model showing the impact of the strategies on the number of buyers and sales, taking into account factors like sales conversion rates, marketing expense, ROI, and payback period. For those interested, the report provides links to the research’s data set, financial model, and customer typing tool that identifies the segment to which a consumer belongs. As a side note, I’d like to mention that the research is not a traditional survey or conventional segmentation study. The approach used comes from a different tradition, that of cognitive economics. In this case the research was concerned with understanding the ideas that people have towards winery e-commerce, quantifying the “pulling power” of marketing messages by computing how much they increase or decrease consumer interest in buying wine online, how much they value each marketing message, and creating segments based on groups of ideas that “hang together.” Findings show that trade-offs that people make between what interests them and what they’re willing to pay. Last, we have streamlined our research process into an app called Big Mind. The app allows any winery to study any aspect of their business. The app is in beta, available for Android devices, with an iOS app available later this year. It is free to use. Anyone interested in working with it should contact me: info@sdrconsultingllc.com, and we will make the proper arrangements. Thanks for the follow up for the benefit of the community Stehpen. Much appreciated! You're welcome Rob. The reason we did the study was to help wineries grow their businesses. The e-book can be thought of as a playbook, not a bunch of stats. Because the notion of cognitive economics is new to many, and probably sounds imposing, I'd like to suggest that anyone interested view Malcolm Gladwell's TED talk about it and his profile of my collaborator and co-author Howard Moskowitz. It's called "Choice, happiness, and spaghetti sauce," available here: http://goo.gl/rzYE8F. Malcolm explains it all as only he can. Rob, very thought provoking post. Having been in DTC through a couple of recessions, and most important, through the evolution of increasing sophistication of our guests, DTC needs to continue to evolve. To me, that means engaging guests where they are. Let's not wait for them to come to us. Every state has a wine country now, there is a proliferation of brands in the marketplace, and there are competing experiential options; there are more choices for our guests than ever before. Another thing to consider...in areas like Napa and Santa Barbara that are limiting the number of guests per day, eventually those wineries will hit equilibrium where they have members coming back in to visit, and the pond of "fresh prospects" will shrink. If you are only allowed to see 100 guests per day, and 50 of them are returning members, you better have a strategy to sell them more wine, to retain them, and to make the most of every prospect (including their referrals) that walks into your business. The trick is finding a resource efficient way to do this. Let's face it, we all have limited resources and every choice comes at an opportunity cost. I don't have the answer, but I'm willing to try a few sound ideas. Liz - you should join the SVB on Wine community at the top right and you wouldn't have to be Anon 10:24. Good thoughts though. 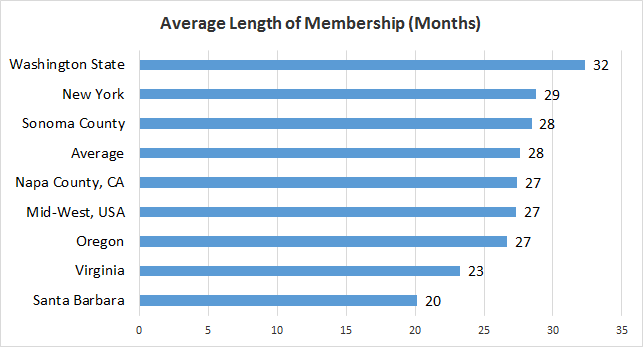 1) Hard to grow a club from the tasting room if an increasing percentage are members already. 2) Engage guests where they are. The second one is where I am trying to direct the winebiz conversation. Wholesale continues to consolidate. Large wineries continue to take an increasing share of the market. For the fine wine business to survive - it HAS to evolve new strategies to create impressions and experiences "where they are." We are already limited by region with a large percentage of guests coming from within a day's drive. (That's a question we asked this year on the survey and are getting really interest results. The overall point though is if you are dependent on your region alone for sales growth - you are eliminating the other 49 states! As a current member of a number of wine clubs in and around Healdsburg and in Napa, one of the things that irritates me is being "discriminated" against for being a wine club member. I buy about 60 cases of wine per year and have a substantial cellar, so I imagine I am someone whom a winery would consider an important customer. As background, I used to own a retail wine store and am currently in the software business (although retired from active management). To stay busy, I wrote a cellar management software program (CellarInfo) which allows me to keep meticulous track of wines I purchase and consume -- is that ADHD or OCD? Anyway, what I mean by discrimination is that some wineries use club shipments to clear out wines from previous vintages. The wines may or may not be in tip-top shape. From a consumer standpoint, I would prefer they put these wines on sale and ship me the current offerings. In other cases, if a wine gets a 90+ score from Spectator, Parker, etc., it rarely shows up in the club shipment. And there are other behaviors that are problematic. I watch carefully and when a winery continually exhibits these behaviors, I tend to drop out. I hope this is a word to the DtC wise -- that consumers aren't stupid. Paco - You are a critically important customer and any of those behaviors noted should immediately engender resignation from a club. Why should a consumer pay for something they don't want or is of poor quality? I'd ask one thing though: Communicate with the winery. As an industry, DtC didn't really start until 2010 so we are very new at this. All wineries want feedback so when you run into those behaviors, feel free to quit the club or not, but please pass on the negative consumer experiences you are having to the winery itself. Most will want to make them right but either way, your opinion is of tremendous value to winery owners. Paco revealed 3 vital pieces of information that, if a winery bothered to ask, would establish him as a high lifetime value customer. Paco said he 1) buys 60 cases a year, 2) has a cellar, and 3) uses cellar management software. (Hell, he wrote the program!). But of course wineries don't bother to learn about their customers, they just want to know what your credit card number is. This stems from the nature of winery communications, which are almost entirely sales-driven. If the only time you "talk" to customers is when you want them to buy something, you never give yourself the opportunity to listen. A social media proponent would be jumping up and down right about now and rightly so. All of Paco's data-points could just have easily been teased out of SM dialog. The trick is not to turn SM into a naked data-grab. That is a skill. Just as being a good conversationalist is a skill. Back to Rob's question: How are you going to sell to people who don't come through your tasting room door? My answer, if it isn't obvious from the above, is to make friends before you make sales. Think of it as a process of obtaining information, paid for (in whole or in part) by sales. This is the essence of direct marketing. Once you understand the flow, it unlocks many more opportunities. Fred - thanks for the response. Greatly appreciate your view. Another of the issues we face is the lack of big data. Analytics might pull out Paco from a sea of consumers, as being a top tier client, but if he's in your wine club it's possible the inattentive winery could see him as a disgruntled consumer who bought one case.... when in fact he buys a LOT of cases and you as winery owner already have a relationship with him. That's the current holy grail. I'm talking with a few different groups of people who are trying to solve for that, but it can't come soon enough. We have to be better at selling OUTSIDE the tasting room. Here a few ideas for engaging people who have expressed interest in your wines, whether they've been to your tasting room or not. 1) Use Twitter keyword search. For example, search for anyone who mentions the name of your winery (if they don't @ mention your account), or a specific bottle/label, i.e. “Insignia.” One of the true benefits is that you can see their tweet in context and respond accordingly. If it's a retailer advertising your product, maybe say thanks, or retweet, etc., but no need to market directly to that person. If it's someone posting an Instagram photo of a bottle of your wine that they're enjoying at a restaurant (and just paid 300% above retail for), you can reply with "So glad you enjoyed it! Get 10% off when you join our wine club! Click here for details! [link]." At worst, they aren't the type of customer who buys in bulk or joins clubs, but maybe they follow you back, or at best, they take you up on the offer. Either way, you've just engaged someone who has expressed interest in your product who may never step foot in your tasting room. If you ship wine, anyone can be a customer! This is one of the purest form of targeting we can imagine. You only have 140 characters, so there's little room for nuance. You can be 99% sure what the customer's intent or interest is from their message. Most Twitter apps or the Twitter.com web site allow you to save search terms so you can monitor them over time. Try different combinations for products. Maybe just enter the winery name. If you're searching for multiple keywords, try it raw and then in quotes, i.e. Phelps Insignia vs. "Phelps Insignia." Pull up your saved searches once a day or every couple of days to see who's talking about what. As you release new items each month or quarter, add/remove search terms around those releases. 2) - Claim your Foursquare business profile and you'll be able to view stats on how many people checked in to your business recently, or who are your most frequent visitors. If those users have added their Twitter handle to their Foursquare profile, it will appear beside their name and you can then go ahead and follow them and reply to them directly! These stats are located under the 'Real World Analytics' tab of the Foursquare Dashboard. Bonus tip: Be sure to add your Twitter (and Facebook and Instagram) handle to your Foursquare business profile. This way, whenever someone checks in and shares their activity on Twitter/Instagram, you'll automatically get an @ mention and can respond ASAP. A simple tweet like "@joecustomer Hey! Thanks for visiting!" can go a long way. And, it also makes them aware of your handle so they can follow you back if they're not already. You don't need to be selling all the time. Ask them what their favorite wine was that they tasted at your winery. Start a dialogue. If they seem engaged, then follow up with an offer about clubs or individual bottle purchases. Offer a coupon, suggest they sign up for your newsletter, etc. These people are the low-hanging fruit. Continue to engage the people who have engaged with you, even long after they've left the room. You can do a similar thing with Facebook/Instagram check-ins. If the person checks into your location, you should get a notification on your Instagram account or Facebook Page (create/claim your Page if you've not already). View the check-in notifications for your account and respond to anyone who checks in. Say thanks, suggest they Like/Follow to be updated about upcoming releases, point to a link to your online ordering page, ask them to sign up for your email newsletter, etc. Again, they've engaged with you. Don't be shy. - Engage people who have rated your wines on Vivino (or CellarTracker et al). Create an account for the winery or for yourself as a representative, tasting room manager, etc., if you don't already have one. Look up your wines and see what people are saying about them. If someone rates your wine highly, comment on their notes/ratings and...say thanks, post a link to your online ordering page, ask them to sign up for your email newsletter, etc. Again, they've indicated that they like your wine. Be thankful! And engage! Matt - Thanks for the practical comments. My good friend Paul Mabray has been singing this song for as long as birds have tweeted. The easiest way to engage a consumer away from the winery is listed to the social discussion and engage. There are still a huge percentage of wineries who have no digital engagement. Funny how so many comments keep centering around more and more impersonal and "electronic" 'fixes' to this. However, I can confidently state that we have actually *talked* to more club members and solicited their feedback about wine clubs than any other source in the wine business. Keep in mind we take 500+ inbound calls PER day, mostly from club members, and of course, we make 10,000+ outbound calls per day. By any measure, that's an awfully large earful of feedback, both good and not-so-good. So, what does it tell us? Improving your club is actually pretty easy. It takes effort though - the big reveal is to pick up the phone and call your customers. We've signed up 1000's of club members this way and kept 1000's from cancelling. I've written extensively on this topic and published the whitepaper "Double Your Wine Club" late last year. It's not a sales pitch - it's real feedback from well over 100,000 wine club members and what THEY have to say about this topic. Maybe consider adding age groups for wine club members to your survey. For us, interestingly the Baby Boomers and GenXers are pretty close, with more Millennials every year. NorCalOkie - Thanks for logging in and the comments. I came from marketing in a different industry to the wine industry three years ago. My big takeaway is there is a lot of laziness and lack of innovation in this industry. Many wineries create "cookie cutter" programs without really understanding who their customer is. I've found working with many clients that wine clubs are not intelligently or strategically run. Essentially they should be a loyalty or reward program for your best customers. Inclusions should be engineered directly from the data you have gathered from their purchasing habits and what you know about these people. What do they want, what do they care about, who are they? Decisions should be made on data and not what the winery has done for years or what makes sense for the winery (or their POS). I work with and also belong to wine clubs that do not have tasting rooms. They have to work harder and smarter than wineries with tasting rooms. Wine brands who operate loyalty programs with no tasting rooms can be very successful when they 1. have invested in their brands in other ways (have developed relationships with their customers via social, email, events, clever brand message that resonates with their customers), 2. truly know their customer and apply appropriate marketing tactics with every communication (personalized, handwritten, curated packages, surprise & delight moments), 3. Understand that a club is more than about shipping wine. What else can you offer as a perk? A test drive of a Tesla? Access to a sports game? It is different for every brand. Wine is an emotional purchase so wineries need to really understand why a customer chooses their wine over and above every other wine brand - and what other brands (beyond wine) the customer likes. If they can show the customer really know them and what they like they will go out of their way to buy from them, and keep their wine club shipments going. 4. Every shipment generates word of mouth which in turn generates referrals and increases loyalty. I have told almost everyone about one of the clubs I belong to and it has no tasting room, but I absolutely love what they do and identify with their brand. I cannot imagine ever discontinuing that club. Creating word of mouth through the shipments is critical element. 5. Develop a relationship, for real. The club is not enough to develop relationships with customers, you need to engage on social, email and pick up the phone. Understand how they want to be communicated with. Personalize what you offer them. Show them you know what they like and offer it to them, first. I would also add that shipping goods are only going to get more important, with Amazon, Blue Apron, Sunbasket etc - food (and wine) delivery (and everything else) to your home is going to be the norm in the future. The future is all about ease, convenience and personalization. I would advocate for a club or loyalty program, or in some cases allocation lists, for every winery that wants to be in business in the long term. On the online shopping trend of shipping goods to your home, see this article. "Web-Shopping Deluge Boxes In Landlords"
"The biggest landlords in the U.S. are being crushed under a mountain of packages, leading one large apartment operator to stop accepting deliveries and others to experiment with ways to minimize the clutter." Thanks for the perspective. I'll quibble only on one point, which is the use of "lazy." While there are always exceptions, my perspective is wineries really want to figure this out. I can agree with the other comments largely, but I think you may discover what I did after working here for a decade. From the outside, it's easy to be critical. I had a lot of experience in other business and what I saw here made no sense. It seemed like simple fixes. It took 10 years of immersion to truly grasp the business. What I've learned is change comes slow in this business. That said, there are ALWAYS disruptor changing the rules and making everyone keep up. I hope you are one of them! Those same urban center apartment dwellers whose landlords are imposing restricted or eliminated online shopping deliveries to their residences may also be public transport users. Last year I bought a mixed case of wine from a small winery in Santa Ynez valley. Along with the wine I received a nice note from the owner wanting to know where we had met (assuming I think, that customers were most likely to react to winery visits or other tastings). As it turned out, I had read about his winery on either CellarTracker or a wine blog. I took his message as an invitation to suggest a change to the wine club of his winery. Most, if not all, wine clubs are based on regular shipments of wine to the club members--might be quarterly or a few times a year. These kind of shipments are a major hassle for many customers. Having to be home when the wine is delivered, to sign for it, etc. I think this is a reason why only x% of visitors join the wine club and why they last less than 3 years. I order most of my wine either directly from wineries or from wine stores with good selection/price--that can be a hassle also but at least I control the timing of the shipment. So, I suggested to the Santa Ynez winery owner that they expand their club to allow membership to be based on annual volume of wine purchased, where the customer chooses the shipping date. I am guessing this would expand the membership and sales of most wine clubs and retain members much longer. The owner of the winery wasn't too receptive to my idea. Bruce - really great perspective. Thank you! I'm in clubs, but I have it delivered to my office so someone is there. It is a pain to take it home though. Volume is another component that is a negative on club tenure. At some point, people have enough. They stop. Customers drink different volumes so at a point clubs have to figure out how to match their customers demand. To that end, the easiest thing to do is allow a pause in club shipments while remaining in the club with the other benefits. Our research has consistently shown that customers who retain choice, buy more. But that thinking has to be expanded to include shipment dates, and volumes. Great article and insight. Obviously, as the founder of a digital DTC web business, this is near and dear to me. (Before that I owned a bricks and mortar wine store in downtown Chicago so I completely uderstand how great service can distinguish a business.) I think the critical point in your article comes down to one word: experience. Wineries may not think their wine club shipments represent an opportunity for their customer to have an experience, however they're mistaken. Every opportunity to engage with a customer is an opportunity for an experience. Every. Single. One. You know our business name so I won't mention it, but it might surprise you to learn how many of the Napa/Sonoma wineries we work with view the customers who purchase via one of our weekly online events as "our customers" and not their own. This is insane. We share the names, addresses, emails, etc., of the customers on purpose so the winery can fulfill the orders and by design so the winery can grow. The amount of wineries who drop the ball on servicing these new customers is mind boggling. These are brand new customers! Customer service requires effort. Consistent, creative, relentless and dedicated effort. It's simple, but not easy. One look around at ANY industry will reveal just how lacking exceptional customer service is. It's why we make personal phone calls to our customers. It's why we hand-write thank you notes to winery partners and customers. Great service is needed by the small wineries because the odds are stacked against them. 99% of the people in the country aren't going to step foot in their tasting room, so they better find a way to a) get in front of them and b) dazzle them with service when they do. There are som ewineries who understand this and my guess is they have membership retention outside the bell curve. Keep up the great work and Happy St. Patrick's Day! Thanks Martin Cody from Cellar Angels﻿. Agreed - building a brand is one interaction at a time. It's positive or negative but when negative, it takes multiple positives to overcome. And even negative experience is an opportunity to change a clients mind and make them an advocate. It's the basics but we all need to remind ourselves. If the average club member sticks around 28 months, was it 28 shipments or 8 shipments before cancellation? I know some wine clubs ship monthly. Was the club member within driving distance or out of state? What’s the average retention of an out-of-state versus in state or 100 mile radius? How many club shipments were picked up personally or sent in the mail? I think a greater definition of type of club and geographic proximity would lend some additional data points for discussion. A wine club to an out-of-state or long distance customer may not provide any benefits, except a discount on wines, shipping, or both. What “experience” did the customer sign on for? If the discount is the sole experience, than that is easily commoditized. The breadth and depth of flash retailers, wine clubs without the winery, can easily beat any winery wine club on price every day of the week and offer free shipping without being captive to a single winery. There are dozens of “tailored” wine clubs out there, offering a wide variety of wines from around the world. A wine club at a winery that emphasizes wine discounts as part of their club benefits seems to be commoditizing itself in the long run, the long run may be defined as 28 months before an alternative is found simply on discounts and low prices. Not a good formula for winery wine club growth. Great question David. We'll have several of those answers when the survey closes Sunday. 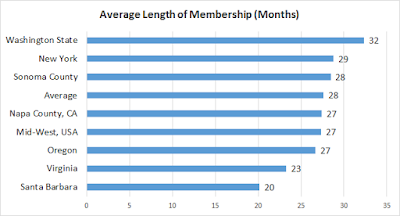 I asked this year what percentage of club members were within driving distance. I got a really surprising answer, but it's totally dependent on the AVA. As a teaser, I expected Napa to have clubs that were 50+% or so from the Bay Area. It turns out they actually average right around 20%. As the owner/winemaker of a small (I mean SMALL) winery, getting our name out there is extremely difficult, especially when it's just a husband/wife team with 2 full time jobs. We have been fortunate to work with Cellar Angels to get our name out there. (Piggy-backing on Martin's contribution above.) While we were skeptical at first, their monthly offerings coupled with their in-person private tastings and events for their customers (club house gatherings and the like) have helped us tremendously! But, to couple the sentiment of many of the previous comments, customer service is key! For each new customer, I send a personal note or email letting them know how much we appreciates their support. I have received great feedback (and often shock!) from this personal touch. And, as a club member at other wineries myself, I know this is critical to getting and keeping members. Thanks for this though-provoking article. I've enjoyed the comments and tips from others. Thanks for joining the conversation Kim. We appreciate your view and I am glad you are finding success in this nutty and awesome business. I don't want readers of this blog to overlook the generous offer that commentor Stephen D. Rappaport made to provide a copy of his co-authored research study titled "Millennials, Mindsets, & Money ... and Selling Wine Online". Send him a request via e-mail to info@sdrconsultingllc.com. With Rob's indulgence, I am going to summarize through excerpts the findings of the first part of the study. Readers who are sufficiently intrigued can read the second part of the study on "Mindsets." "Millennials’ Interest in Buying Wine Online Directly from a Winery"
Do demographics, wine attitudes, or wine behaviors drive Millennial interest in buying wine directly from a winery? The answer may surprise you: NO they do not. We repeat NO. And with that, let’s dive into the results. Before going deeply into researching the consumer mind towards buying wine directly online from a winery, we start by doing due diligence. We look at factors like age, income, gender, and wine drinking frequency to discover, if possible, meaningful differences among groups in terms of interest in ideas about online wine buying. It would be ideal if one of these easy-to-measure factors was connected to a ‘magic bullet,’ a group that that can be easily identified, and is very prone to buying a lot of wine online. . . . So what did we find? When you casually ask a Millennial wine buyer on the street, “How interested are you in buying wine online from a winery?” our results suggest that only about one in four would nod their head and say they were interested. . . . The Millennial generation, though treated as one group in much research and trade articles -- “Millennials do this, Millennials do that,” -- should not be. Carefully done Millennial studies recognize older and younger Millennials span life stages -- a 34-year old Millennial is at a different place in life than a 21-year old. We divided our Millennial respondents into Younger (21-26) and Older (27-34) groups to be able to make intra-generational comparisons. We learned that Younger and Older Millenials indeed differ from one another. Older Millennials have a higher natural interest in buying wine online. . . . a bit more than double the Younger group. But, even with their greater ingoing interest, not one single element [i.e., the researchers’ term for “ideas or messages” in the short story vignettes about the online wine buying experience read by respondents] offers any magic. Winery stories, wine quality, discounts, the online experience, fall on deaf ears. In contrast, Younger Millennials are all about wanting a well-reviewed bottle at a rock bottom price. Free shipping, rewards, high reviews, and no commitment or minimum purchase interested them. Although we spotted a few differences between Older and Younger Millennials, each winery must consider whether those differences are sufficiently crucial to develop and invest in a marketing program targeting Younger Millennials. Some marketers might consider the Younger Millennials a segment: They have size and a few ideas that raise their interest in online wine buying directly from a winery. 4. the price sensitivity of Younger Millennials suggests low margins. There may be a better way of interesting them in buying wine online and realizing their marketing potential. Let’s turn our attention to Xers and Boomers to see if they are similar to or different from Millennials. "GenX and Boomer Interest in Buying Wine Online Directly from a Winery"
Q. How about the older generations, Xers and Boomers? How interested are they? Xers are like Millennials overall, about one in four have a natural interest level in buying wine online from wineries. None reaches . . . the threshold for ideas that make a difference. (For this reason we refrained from showing the data). "Generational Targeting Appears to be an Unproductive Approach"
Despite the appeal of demographic targeting, its familiarity, and widespread use, we just saw that Millennials as a generation are not different from Gen Xers and Boomers regarding online wine buying from wineries. Odd as this might appear, our research agrees with newer Millennial studies which show little difference among generations. The interest is just not there by generation. Even when we carved out a slice of Younger Millennials we recognized that the group probably offers limited potential at best. Our data strongly suggest that generational strategies and targeting will neither be productive nor business-building. "How About Targeting by Other Demographics or Wine Attitudes, Behavior and Usage?" Besides age, we captured the typical demographics of our respondents, such as gender, income, region, and education, and a variety of wine attitudes, behavior, and usage, such as their level of interest in wine, their drinking frequency, and the price they typically pay for a bottle. A complete list is provided in Appendix 5. If you are interested, you can review the complete dataset by downloading it from this link: www.bitly.com/WineDataNomaRapp. We discovered similar patterns of the natural level of interest to the generations. . . . Let’s take some examples for illustration. Among men and women, no elements [i.e., the researchers’ term for “ideas or messages” in the short story vignettes about the online wine buying experience read by respondents] reached [a value of] 10 [representing a “big impact on a person’s interest”]. Same for people with household incomes of $50,000 or above. People who drink wine daily are interested in buying wine online when there’s no minimum purchase required and shipping is thrown in. Weekly drinkers want a great wine at a great price. After looking at all the data, there’s nothing in these, or any, patterns that recommend them as the basis for a meaningful segmentation and targeting strategy for wineries looking to sell their wines online. We have to look elsewhere. To Mindsets. Like Paco, I buy a significant amount of wine every year and have a large cellar. I'm on the east coast and I'm a member of many CA wine clubs and I've worked in the industry for some years. I'll share my views/thoughts on staying/leaving clubs. 1. We joined a few clubs while visiting in CA, but for us - that's the exception. 2a. Does the club have flexibility? Whites only or reds only or a mix? 2 bottle up to 12 bottle shipments? Is shipping discounted or free on 6+ bottle orders? 2b. Are there wines that are ONLY available to club members? This is a huge deal for folks on the east coast as only higher production wines make it out here. If we like a cab sauv and a merlot from a winery, chances are we would also like the Petite Sirah and Cab Franc that may be club only. That's a plus to sign up for us. 2c. The service on the phone. Is the rep accommodating and flexible? There are a few wineries where I'm on a first name basis with the club rep. They will send me bottles that are not on the website, tiny production and most of the public doesn't even know exists from that producer. They let me know that I can get large format bottles, one off's and numerous other "insider perks" - and holding for weather is automatic as they are sensitive to the cross country trip. This is the way club memberships should be run from a service perspective. Another big trend I'm seeing is the "allocation only" model. You get on an email list and you get a window to purchase and that's it. These are hit or miss and (for me) tend to be less personal and have less loyalty. For those that release very early (during bottle shock), it's hard to really evaluate what you are getting. Great comments Kevin. Many of your behaviors are borne out in prior work we've done. 2a is a big one that we started talking about 6 years ago with a lot of pushback from logistics ("how can we pick and pack individual bottles"). Most clubs today offer some choice and we continue to evolve to that model. Thanks for this great article, Rob. Lots of useful data and insight! In response to your post, I wrote one developing 7 tactics for family-owned wineries to increase their membership numbers: Selling Outside The Tasting Room. Hoping that helps, please feel free to share your feedback. Thanks! I'm a consumer and enthusiast just getting started as a collector. Having lived the majority of my adult life in CA, I acquired several wine club memberships, some of which I've maintained since moving away and some of which I have let go by the wayside. For me, quality and quality for price are the key factor for retention; however, the engagement factor does play a role. When I lived in CA, I put a high premium on the "experience" factor. It was much easier to join a wine club that included some wine release parties, restaurant events, and other social occasions combined with some bottles to take home. As a cusp GenX/Millenial I think you will find that the "experience" aspect will play an outsized role in acquisition and retention for people may age and younger. As an example, one winery I have stuck with is Tablas Creek (Paso Robles) who produce a monthly newsletter that's actually interesting to read (a rarity), have featured bottles each month (with a discount), run several specials throughout the year, and participate in events across the nation. I'm a member because I love their wine; however they have also done a very good job of cultivating a relationship where they are always top of mind when I think about my wine clubs. One last point I would like to make, along the line of the "experience": there is a unique value proposition to a wine club when you are in proximity to a winery/tasting room. Having a good tasting room/member culture can create a lot of stickiness in customer relationships because your customers come back not just for the wine but for the social experience of your tasting room/events. To that end, I sometimes feel a little consternation at paying the same price for membership while not incurring any of the costs of participation. For those wineries unwilling or unable to "export their experience" to their customers in other regions, some sort of discount could be a strategy for retention. For example, another wine club of which I'm a member offers free shipping nationwide to members on all orders. Not only does this make me feel a little better about missing the annual wine club party, but it also guarantees that I will make at least one extra order per year. I am a Gen X-er and I have a serious wine hobby and habit. We only drink the "good stuff" and rarely are able to find wines we like at our local stores. This is why we are members of about a dozen direct-with-the-winery wine clubs. I've signed up for clubs that have a 6 bottle per year requirement and others that have a 4 case per year requirement, and others that are basically allocation clubs. I'm even a member at a certain club which CHARGES me a $250 annual fee just to be a member, but I have no issue with that because of the personal attention and service I always receive. It's really interesting to read the comments from the other side (re: people in the industry) versus strictly a consumer like me. I've joined and dropped clubs over the years, but there are several things that are VERY important to me when deciding which clubs to join and which clubs to eventually drop. I live out of state so having lots of special events, pick up parties, and other social activities doesn't matter much at all to me. If the club has an annual big deal release party, I will sometimes fly out to Napa to attend, but this is very rare. This is the single most important factor for me. I must be able to pick and choose which wines I want to have shipped to me. This means I will never get any junk (I've dropped more than a dozen clubs that wouldn't customize and sent me so much inferior wine or varietals I don't like -- obviously bottles they couldn't sell otherwise and had to dump them on their loyal club members -- that I would literally dread when the box would arrive). Needless to say, those clubs were out quickly and I was always so upset that I haven't purchased any of their wines in the future. Pay attention, wine club managers: don't send junk (or wine that's not ready to be released; we recently got a shipment from another well known, big name Oakville winery and their cabernet was absolutely HORRIBLE. We'll be dropping them shortly). Discounts aren't as important as complimentary tastings whenever I am in town and drop by the tasting room. Even better is if I can bring guests (at least 3 is best), I can gift a tasting to someone else traveling to the area, and if I can stop by without restrictions (I really hate the new trend of allowing only one complimentary tasting visit per year, quarter, or month). If I'm one of your best customers and spend several thousands of dollars on your wine every year, the LEAST you can do is roll out the red carpet whenever I visit your winery in person. I'm lucky enough to fly out to Napa about 6 times a year, and I want to be able to stop by, taste whatever's new, and take home some bottles. I'm a long time club member at another very popular and swanky winery along Highway 29 and they have the best customer service ever. Club members truly get the VIP treatment, there's a special picnic area for members only, they send me a complimentary "anniversary bottle" of wine every year to celebrate my club membership, I'm often called by name, and the host knows my preferences the second I am seated. I know not all wineries are capable of this type of service, and I don't expect you to remember my name or my occupation or the type of pets I have, but it's pretty easy to make notes so you can at least pretend that you remembered all of those details about my husband and me. Excellent hosting when I visit is really critical: one club lost my business when they gave my party subpar treatment (I had brought along two friends and they did not put their best foot forward). Always put your best hosts on when a club member visits, it truly makes a difference! I live out of state and this is a big deal for me. Whenever there's a special shipping deal on a case or especially a half case, I usually take the bait and buy. Discounts on individual bottles of wine are also nice, but it sometimes feels like you're cheapening your brand by giving HUGE discounts to club members. When I see a 30% savings for club members, I feel like a chump if I'm not in the club because I will be overpaying for your bottles. (I am not a member of any club that extends a greater than 15% discount). Also weather holds are a huge deal for me too, as I live in a very hot desert climate. Nothing turns me off from a brand more than a tasting room host that immediately and forcefully pushes the wine club. It's offensive. I'm tasting wine to learn, relax, and hopefully enjoy. I have been to more wineries than I can count where the person behind the bar starts yapping about the club before they have even poured me ONE TASTE OF WINE. I'm not shy to name these wineries either, if anyone is interested. It's salesmanship 101. If I pick up the brochure it also doesn't automatically mean I'm interested in joining, I just want to read a bit more information about it. If I want more info, I'll ask. The most offensive sales pitch ever happened earlier this year at a Valentine's Day wine club event at one of the big boys in St. Helena. We paid $200 per person to attend this dinner, and the entire time all the staff did was try to sell us wine. At the pre-dinner cocktail reception, staff made at least half a dozen announcements about buying wine. When we were seated at the table for dinner, there was a price sheet on top of the menu, and staff walked around to physically hand us pens and order forms, hovering behind us asking if we wanted to order anything. I left fuming, and I am considering dropping that club very soon (after nearly 5 years of loyal membership). Don't be pushy. Don't shove the wine club down our throats. So what made us sign up for all of these clubs? Some places were no-brainers as soon as we tried the wine and fell in love. I like the convenience of having wine shipped directly to my office. I like knowing that I have a long list of wineries where we can go taste for free whenever we are in town. I like that there are sometimes events where I can have an excuse to hop on a plane and go out to Napa for a weekend. Most clubs are just a bonus because it's wine I would've ended up purchasing at the winery anyway, but why not enjoy the added benefits that come along with membership? Joining wine clubs is great for us because our everyday bottles happen to be very nice wines; we never drink wine from the supermarket or a mass market wine shop anymore. We want those special bottles because life's too short to drink mediocre wine. As you can tell, I'm happy to share my opinions with anyone in the industry. If you have a question for me, ask away! I'll be happy to give an honest answer from a consumer's point of view. That's quite a lengthy POV. Might be a record on the blog. Thanks. Should I take your observation as a tacit challenge? It's not the contest I'd vote for Bob! Brevity has a place still. Ask any Millennial how long a post should be. I have some very strong opinions on this topic, LOL! Oh! And feel free to delete my "too long" comment if it's not helpful. Just trying to share a consumer's perspective. Annual DtC Survey is Open!